Everyone craves soup when they are sick – it’s one of the ultimate comfort foods, narrowly behind ice cream. So when I was sick last week, I had a massive craving for miso soup. Two problems. One, I had none of the ingredients. Two, I’d never made miso soup before. I just order it when I’m at a Japanese restaurant. So I decided I would buy all the ingredients, make miso over the weekend, and freeze some for the next time I’m sick. Now yes, in theory I could buy instant miso packets but where is the fun in that? I kinda used the recipe in my vegetarian sushi book combined with vague memories of seeing other recipes (yes, there is such a thing as vegetarian sushi. No, sushi does not mean raw fish in Japanese. That’s sashimi. One of my best friends and I got in a fight about this in a grocery store once – he was wrong). This sounds like a disaster in the making, but it wasn’t, I promise. 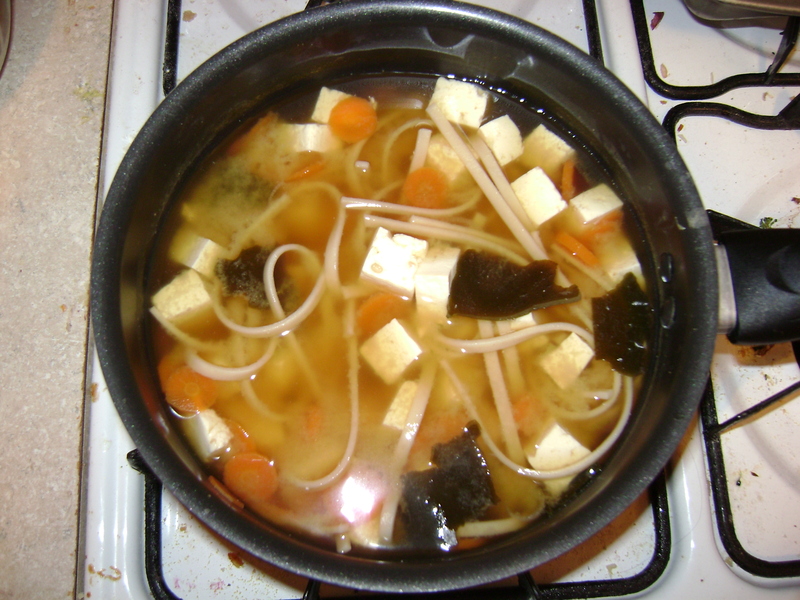 To make the soup: Simmer some kombu (seaweed) in water for 10-15 minutes, and then remove. Add udon noodles and thinly sliced carrot. While that’s cooking, dissolve 1-2 tablespoons of miso paste – I used white miso – in some hot water. Add that, sliced scallions, tofu, and more seaweed to the broth. Simmer til done, then add a dash or two of soy sauce. Eat, or drink. What I learned: 1. Kombu is not a good seaweed to just eat – too thick. Wakame is just way better. Spring for wakame. 2. Udon noodles are awesome. I’m really excited to do more with them, although maybe not in miso soup. 3. I really need to find an accessible Asian market so I can really get the right ingredients. Buying ingredients when I’m in Cali and bringing them back to the east coast is just not feasible (yes I’ve done that – its so hard to find good, authentic vegetarian curry paste that I had no choice). 4. All in all it turned out pretty well. I liked the udon, but its not supposed to be there so I think I will keep it traditional and omit the noodles next time. Was it as good as in my favorite restaurant? Of course not. Was is perfectly decent, and satisfy all my cravings? Yes. And that makes it a success in my book. This week’s new recipe happened a little later than intended … MLK/inauguration/my birthday weekend was extremely busy. The plus side of the craziness is that because I have an amazing sister and an awesome best friend I now have 3 new cookbooks to play with. Three!! Now I can cook all the things! 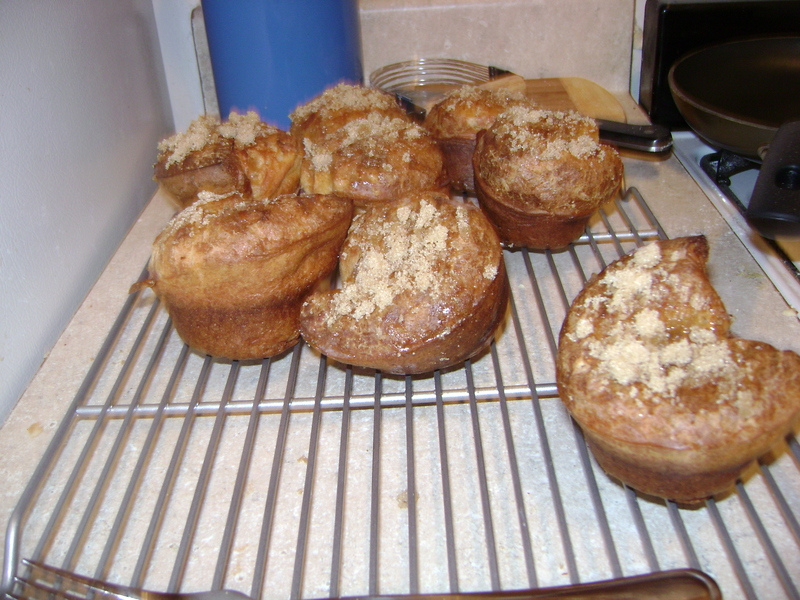 Starting with Brown Sugar Popovers …. The book my sister gave me is called flour, and is from a Boston bakery of the same name. And it is slightly intimidating. The pastry chef who wrote it is very precise – down to weighing all the ingredients and states how important it is to follow things exactly. Which is not my strong suit, particularly in cooking. So, like the parsnip tarts, I went with a twist on something I felt comfortable with. I’ve been making individual yorkshire puddings for months, ever since they were mentioned in an episode of Dr. Who and I felt an overwhelming urge to cook them. The popover part went fine, totally straightforward and basically a standard popover recipe with some cinnamon added to the batter. I ignored the timer instructions for cooking as per usual – I took them out when they smelled done. Piece of advice – every single oven is different, and cooking times always varies. Base cooking times on the recipe, but make the final decision on scent, coloration, and/or feel. Which takes practice. I ran into trouble with the final touches though … After the popovers are done, you are supposed to brush with butter, and then roll in brown sugar all over. Well, I don’t have a pastry brush, and I think my brown sugar got old. It was all clumpy and dried out. I ended up pouring butter on the tops and sprinkling brown sugar over that. Which worked well enough, but wasn’t what I was going for. The wonderful thing about cooking though is that mistakes, or minor difficulties can have happy side effects. After sitting overnight, the butter-brown sugar on top continued to combine (partially due to sitting out in my overheated apartment) and turned into this wonderful, goopy, sort-of caramel sauce. It was good enough that I think I’m going to try and replicate it intentionally next time around. Gotta love happy, sugary accidents. I rarely eat pasta. Maybe I ODed on it as a kid, but I really rarely eat it anymore. It’s boring. And unlike when I lived at home I don’t have a giant basil plant to make into pesto in my apartment. However, I was out of bread and wanted something with starch so pasta it was. But it had to be pasta in a new way … Like so many times before Greens came to the rescue! Greens is one of my all-time favorite restaurants and has published three cookbooks. I have never disliked anything I’ve eaten out of them. I swear they could have a dish made of brussels sprouts, mushrooms and nuts and I’d still like it. They are magic. The Recipe: Linguine with roasted peppers and broccoli. 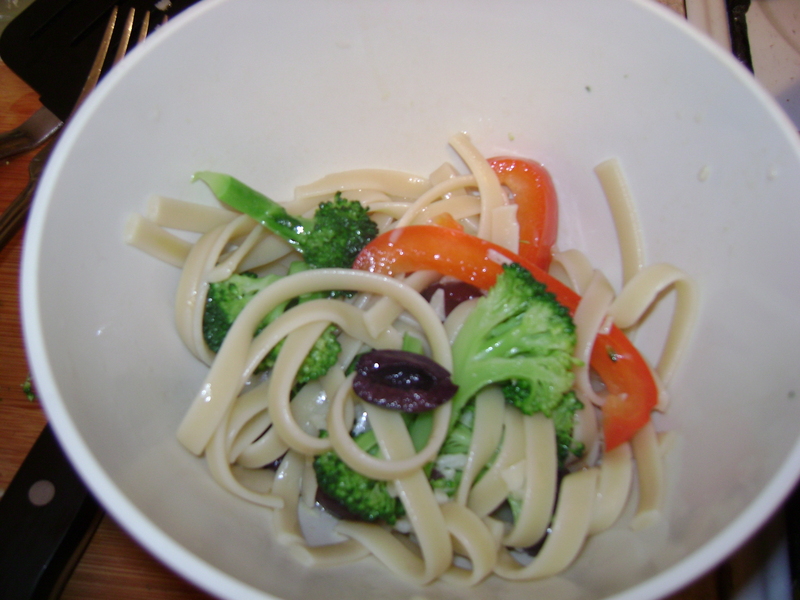 Simple enough, you saute garlic, add in the bell peppers and par-boiled broccoli and then cooked pasta and some sliced olives. And lemon juice if you have it (I didn’t). I was also too hungry and lazy to roast the peppers, but I sauteed them a bit longer and it all worked out. 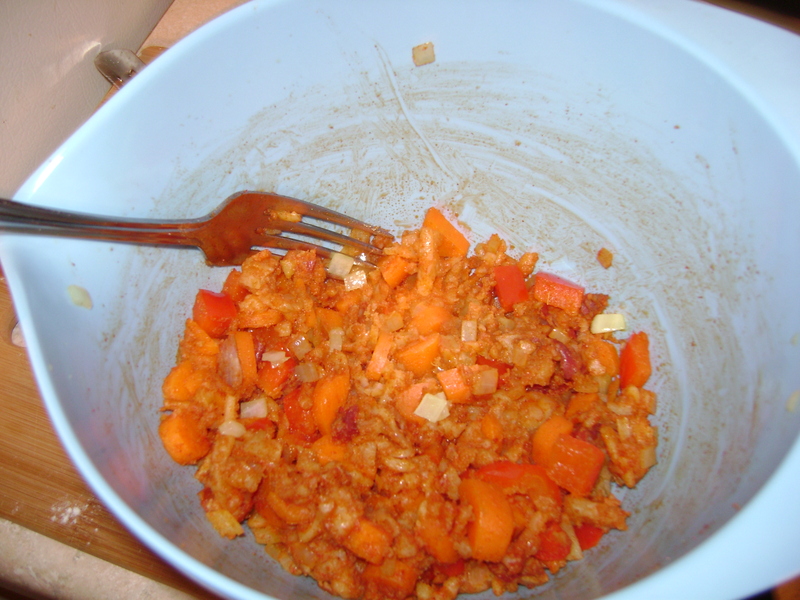 So many times simple dishes are great – this was a filling and relatively healthy meal with very generic ingredients. Admittedly, I love almost anything with garlic and olives in it. But it was a good reminder that a pasta meal doesn’t have to be boring. Fried food is a wonderful, wonderful thing. And if you are frying something with a lot of vegetables, you don’t even have to feel too guilty about it. Vegetables make everything slightly healthy, right? Well, that was my logic with empanadas – they may be pockets of fried dough, but at least on the inside, its basically just veggies and spices. The recipe I chose is from Moosewood’s website. Moosewood is a vegetarian restaurant that puts out a lot of cookbooks. I’ve never actually been to the restaurant, but I’ve used their cookbooks – although some of them include fish. I’m sorry but fish is meat – they are animals and therefore they are meat. Period. Empanandas de Papas – A somewhat time-consuming recipe, but fairly straight-forward. I used red peppers instead of green, and left out the pimentos and cream cheese. I don’t like cream cheese unless its in cookies or cheesecake, so adding it seemed unnecessary. I also tripled the amount of spices. In reality, everyone should spice to taste, though you should always still be able to taste the underlying ingredients. 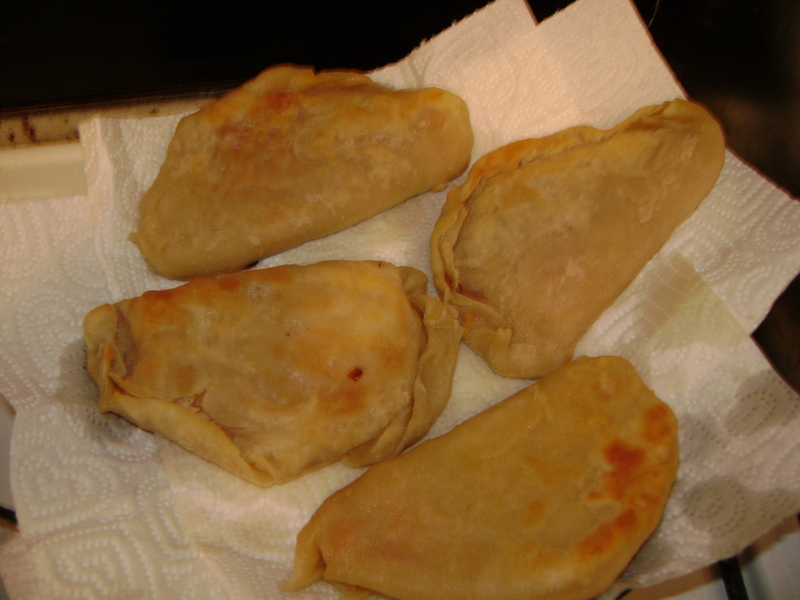 About the empanada dough – it took a bit more water than the recipe said, but it also helped that I let it sit awhile – it made the dough more pliable. Finally – I don’t deep-fry things, so I just pan-fried this in olive oil. It worked fairly well. I love this recipe – It’s yummy but its also a complete meal that I can easily take to work during the week, which is definitely a factor when I chose what I’m going to cook on any given week. You can eat them plain, or top with salsa or more cheese … Ok, writing this post has made me hungry, so I’m off to leftover land! Tonight was my second date with parsnips, and I decided to be a little more bold this time around – parsnip gnocchi. Gnocchi has been one of my favorite foods since I was little, but I’ve never really made it myself. I’d either just cook the pre-made stuff, or my mom would make it. I sometimes helped, but it was 90% her because it was always great when she made it so why mess with a good thing? But now was as good a time as any to take the plunge and make gnocchi all by myself. The Recipe: Now there are several ways of making gnocchi, and I chose the more French way – which is choux paste based (naturally that’s how my Mom does it too). 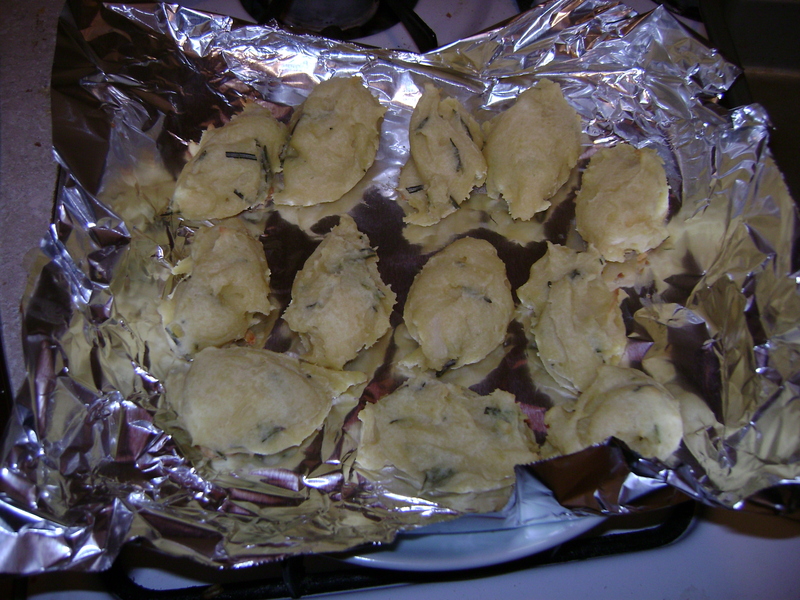 In a saucepan – melt butter in water, and then add flour. Once all the flour is mixed in (it will be very stiff, dense and solid) you add egg and mix that in – which is more challenging than you might think. Exact proportions elude me, but I used about 1/4 cup water, 3 tablespoons of butter, 1/3 cup flour and 1 egg. Add mashed parsnip (prepared by chopping a parsnip into small pieces, steaming them and then mashing them with a fork) to the choux paste. I also added some fresh rosemary because it was in my fridge and at the “use it or toss it” phase of existence. Shaping/Cooking the gnocchi: Get a spoonful of dough and shape it into an oval using another spoon, then drop it onto a baking sheet. To keep the dough from sticking to the spoons, dip them in water. Rather than boiling, which is the norm, I actually baked the gnocchi – at 350 for maybe 20 min. Bake until crispy on the outside and starting to brown. Greasing the pan is probably a good idea … I didn’t and the gnocchi got stuck to the aluminum foil which was only a minor annoyance but still.